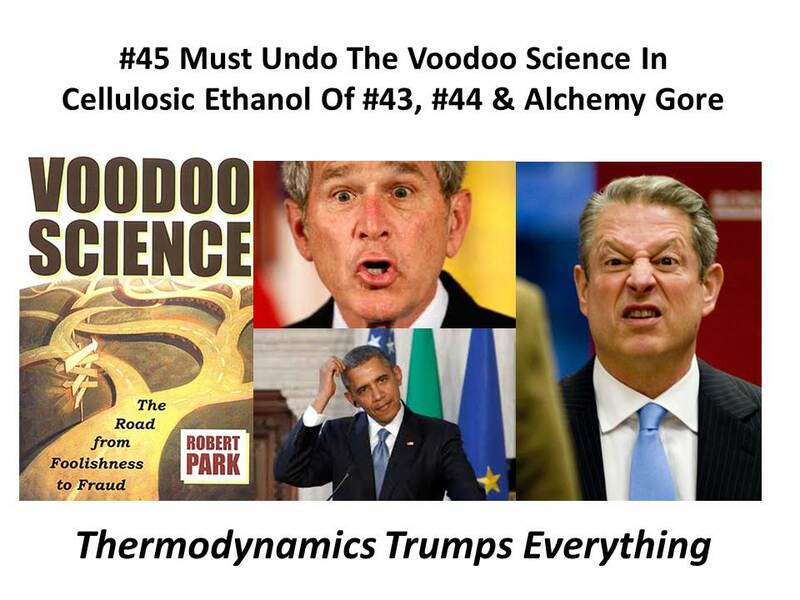 I just discovered that Robert Park wrote a book titled Voodoo Science - The Road from Foolishness to Fraud. I will buy the book and report if he covers the Bio Fools Khosla, Kammen, Gates, Branson, and Doerr in the green space. This flow chart says it all. Just follow the money! Then follow the influence. Then follow the pollution. The pollution includes higher than advertised CO2 emissions, hundreds of tons a year of hazardous solid waste with lead, chromium, arsenic, and benzene, and also the de-coking emissions. 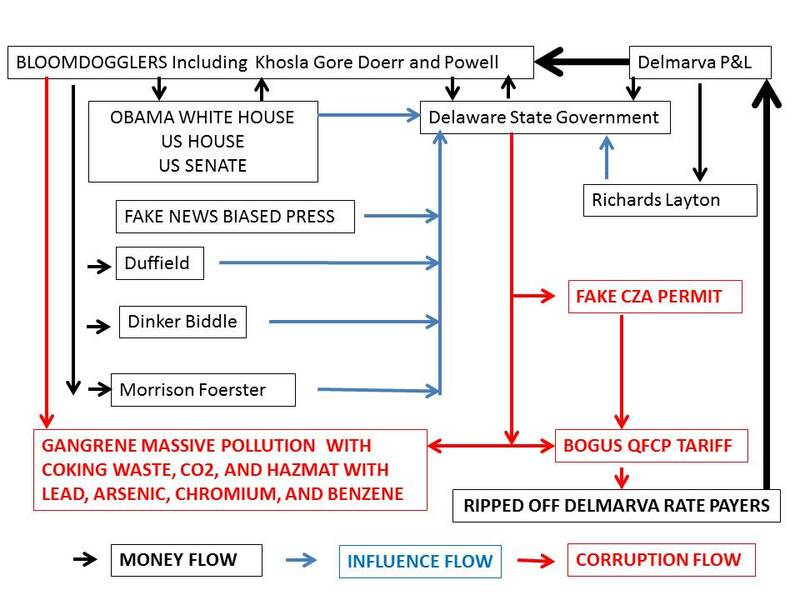 The money flow from DELMARVA ratepayers to Delmarva for Bloom is now $148,145,460 and grows by approximately $100,000 a day. The Bloomdoggle may have actually gone unnoticed if indeed the electrons were green. But Alchemy Gore and the cronies found the wrong scientist in KR Shridhar who invented the Bloom Coffin that is gangrene not green. Bloom is Solyndra times four and Flint on steroids. 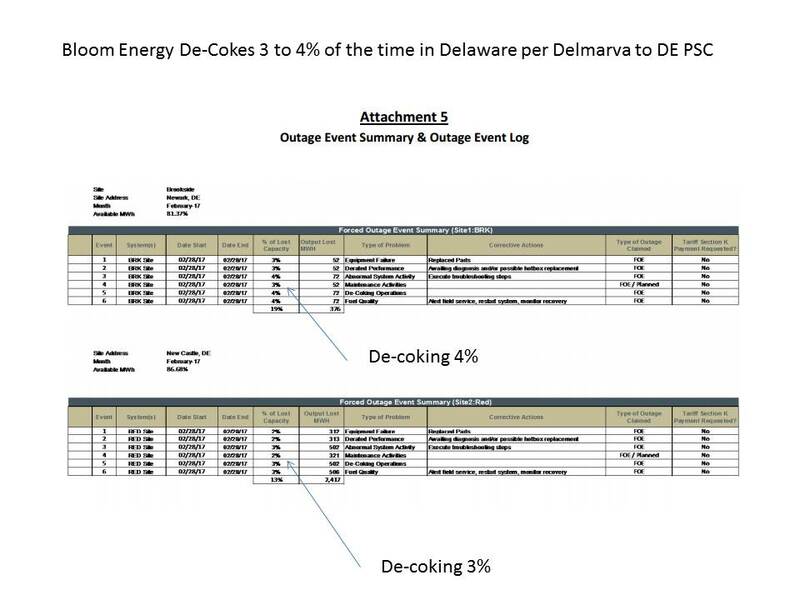 Just when I thought I had discovered all the dirt and toxic waste on the Bloom Energy Bloomdoggle, I found out that they Decoke the Bloom Coffins fairly often in Delaware. Yes these scam artists who are gangrene not green spend 3 to 4% of the time "decoking" dirty coke that builds up on their fuel cell catalysts. The very same practice a refinery or other smoke stack industry has to perform. It is likely they use super-heated steam to react out the carbon (coke). This means there is an effluent stream into the air during the "decoking" operation that lasts on average one day each month for each Bloom Coffin. 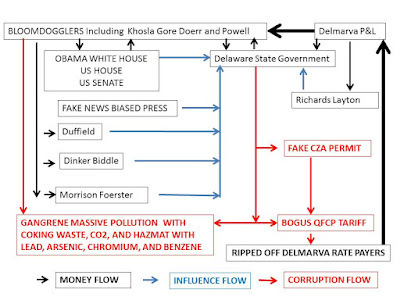 Again Blooming Liars at Bloom and Delmarva did not tell Delaware authorities and the public that the decoking was needed for gangrene expensive electrons Delmarva helps Bloom put into the grid. 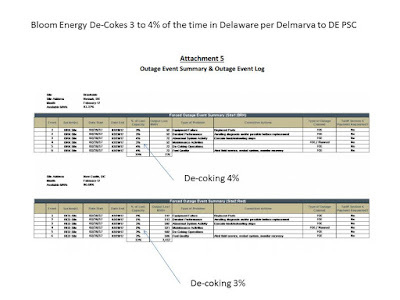 Bloom and Delmarva lied that the electrons were clean and were environmentally beneficial. The electrons have hazmat with lead, arsenic, chromium, and benzene, they have high CO2 emissions , and now they have to be decoked. Lying Bloom told NBC that the Green Machine works for the Koch Brothers. Nothing could be further from the truth. 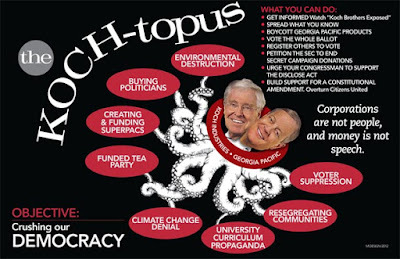 But we know that Gore, Doerr, and Powell the eco-thieves behind the Bloom Energy Bloomdoggle work for the Coke Brothers. I have said Bloom is Solyndra times four and Flint on Steroids. My latest investigation is into the SEC settling with KIOR for $100,000 for crimes KIOR, its officers, directors and major shareholder Vinod Khosla committed . 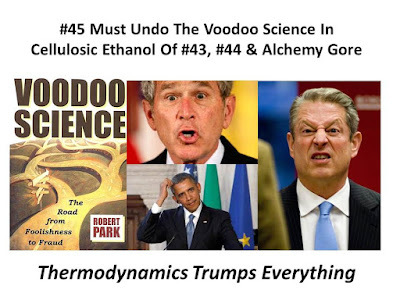 I have written often that KIOR with Con D Rice on its board of directors was a thermodynamic fraud destined to fail. Now it seems that the SEC was in bed to let those being sued off the hook for next to nothing. This will be proved or disproved when I get records under the Freedom of Information Act. But all the evidence points to Obama’s whitehouse pulling string to close the case on behalf of Obama’s contributor and presidential library builder Vinod Khosla. In January of 2015 The State of Missippi sued Khosla and others in Kior for fraud. I have no news on whether that case for $75 million of fraud has ever been settled. 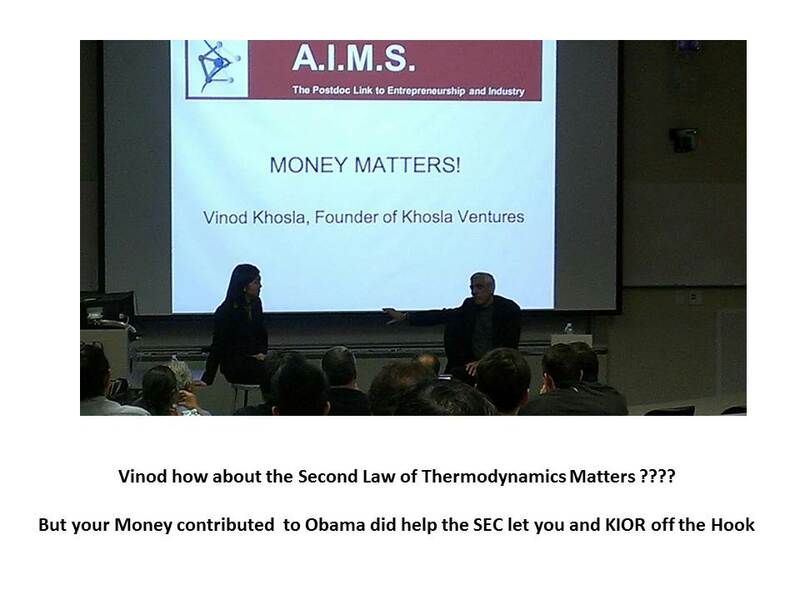 What I do know is that Khosla ran to Whitehouse a few weeks after Old Miss filed their suit. In February 2015 Khosla together with his gangrene hero Doerr had dinner with Obama. The dinner lasted till 2 am. Back in 2013 Khosla also hosted Obama to a fund raising dinner in his own home. Then on September 27, 2016 the SEC suddenly settles the suit against Kior and the others. This is shortly before the end of the Obama administration. The settlement is for the paltry sum of $100,000. Then in December 2016 Andrew Ceresney the head of the SEC enforcement division decides to leave the SEC a few weeks after Donald Trump won the election. There are too many coincidences in the timing of all these events to simply say these are random events without the intervention of a high level hand somewhere in the Obama administration. 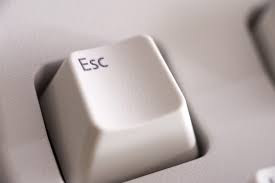 Ceresney had a record of receiving an average of $5 million for each of the other settlements he agreed to while heading the enforcement division of the SEC. None of the other crooked companies had a former US secretary of state (Con D Rice) on their board of directors or a Presidential Library Builder (Khosla) as the controlling major shareholder. Why was the KIOR case settled for bupkis?